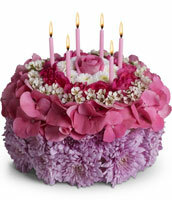 Look no further than Apple Blossom Florist for birthday ideas and birthday gifts! Liven up any birthday party with a festive bouquet of birthday flowers or surprise them with a cheerful "Happy Birthday" bouquet! Or give them a long lasting plant or romantic roses. Everyone loves flowers for birthdays! We offer birthday flower delivery to Oakland, CA. Fresh, hand-crafted cake-shaped arrangement of pastel mini carnations and cushion poms in floral foam, topped with a single pastel rose Includes a cake skirt and candles.